The occurrence of unpredictable climatic events threatens the functional MGNREGA assets. 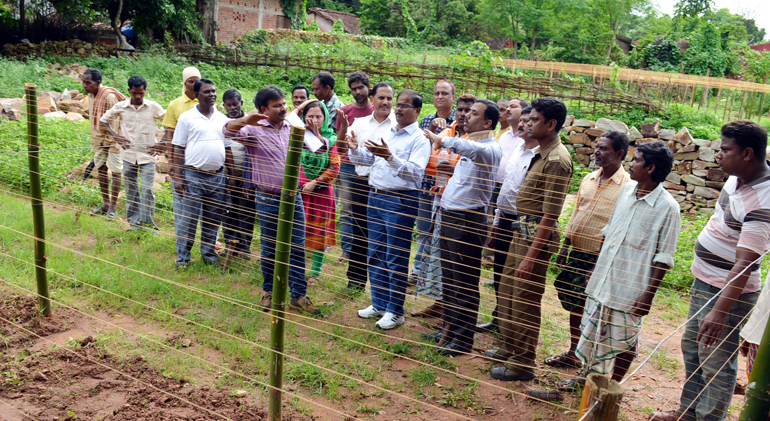 Well-functioning MGNREGA assets such as farm pond, fieldbunding ,WHSetc.is a pre-requisite to rural development. The emerging climatic events (drought, storms, flash floods etc) threatens these infrastructure Thus, is a need for making these climate proof or climate resilence and more sustainable . Climate Resilence is the quality of social and ecological system, which is capable of adapt, reorganized and evolved in more desirable structure for sustainability and better preparation for future climate change impacts. Does not fall back to a lower poverty threshold due to climate related shocks. Manages to stabilize their current income status over a period of time. Have potential for savings, asset strengthening, investment and management of resources. Are well- positioned to sustain and graduate to next level. SGF with the technical support from IPE Global extended its supportive hand with Govt.of Odisha to facilitate the programme for effective implementation, management and maintenance of the assets. It works in two different districts Mayurbihha & Keonjhar which has blocks such as Jamda, Sukurali, Bijaitala, Kusumi and Sadar & Banspal respectively.It sensitizes as well as provide trainings to the communities and their institutional/GP level staff on climate change. It has introduced climate resilient livelihood practices .It works to sustain frequent environmental shocks & also ensure Ground water recharge, Soil moisture retention & protection, Provisioning of water for irrigation, Conservation and regeneration of biomass & carbon stock.